Smoking a cigar can be a scary and intimidating experience. Whether you’re a newcomer or enthusiast, you’ll soon realise that there are certain mistakes that can be made, which can lessen the experience. No matter your level of experience with cigars, you’ll always be surprised about obscure rules and etiquette. In fact, it can be quite oppressive in some circles and it’s easy to be frowned upon by doing something others consider as poor taste. However, in this guide you will learn how to smoke a cigar properly and comfortably without any pretence. Our easy 10-step tutorial will pave the way to stress-free cigar smoking so you can concentrate on your enjoyment. In this guide, we’ll break down the techniques to keep in mind when smoking cigars. We’ll mention a few rules to keep in mind as well as pitfalls to avoid. However, our goal is to present a methodology open to interpretation according to your tastes. Despite what you may hear from elsewhere, we believe that there is no truly wrong or right way to smoke a cigar as long as you enjoy it. However, we’ll offer advice that will ensure that you don’t compromise your enjoyment. Furthermore, some of the steps are covered in greater detail through their own dedicated guides. Throughout this guide, we’ll present you with links when the opportunity arises so you can read more about these particular subjects. Do You Remove The Band? Simply scroll down to read them all our jump straight to one by clicking on it! An easy guide for newcomers and enthusiasts alike. Whether preparing for your first smoke or as a quick refresher, you'll be smoking like a pro in no time! How To Smoke Cigars Reviewed by Charles-Philippe Bowles on January 8th . There are many shapes, sizes, countries of origins and flavour profiles to choose from when selecting your cigar. In fact, it can be very intimidating and overwhelming when starting out. However, cigars are like wine in many respects and as many people know, you don’t have to be an expert to enjoy a glass. One of the most comfortable ways to enjoy your first cigar is to ask a friend who already smokes them. If they know their stuff, they’ll be able to at least give you a few recommendations as your first smoke. Overall, the most reliable way is to seek out a professional retailer that specialises in cigars. They’ll be able to give you experienced advice on the best cigars to smoke as a beginner. Most people tend to agree that it’s best to begin with a relatively mild and good quality handmade cigar. A cigar that’s too full-bodied may be overwhelming as a first smoke. Meanwhile, an inferior cigar may be an underwhelming experience. If you do go to a retailer, you may want to get into the habit of inspecting the cigar to ensure its quality. Being made by hand, even the most reputable cigar brands can host a few defects. Dull Colour: Caused by dry storage or improper cultivation. Spots or Blemishes: Indications of faulty curing or fungus disease. Mould: Caused by storing in high humidity. Tears: Can be due to mishandling but may suggest dry storage conditions. Holes: Likely caused by beetle infestation. Soft Spots: Suggests improper rolling, which will burn unevenly. Hardness: May mean that the cigar was rolled too tight, which will affect the draw. 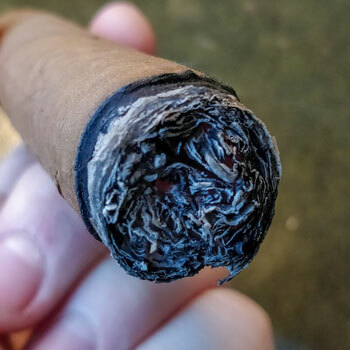 Ridges: A lump that runs along the cigar suggests too much tobacco was packed in the roll. Irregular Shape: Like the above, suggests that the tobacco was unevenly rolled. Always ask a vendor for permission to inspect the cigars by touching them. Feel free to ask a vendor about storage conditions too. 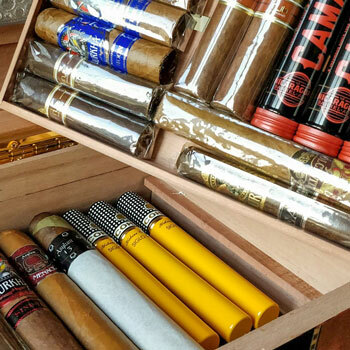 For instance, cigars should be stored in a humid environment that ranges between 65-70%. Any less may dry out the cigars whilst any more can cause the outbreak of mould. Rolling a cigar between your fingers should give a faint crackling sound. This will tell you if the humidity is within the range mentioned above. If the sound is too loud, it may be too dry. However, if you can’t hear anything at all, it’s likely too moist. Finally, be very gentle when handling the cigar. After all, it doesn’t belong to you just yet. A gentle pinch along the body should suffice to assess its consistency and hardness. When buying cigars online, you won’t get this opportunity until you’ve bought the cigars, which is one of the risks when saving money. 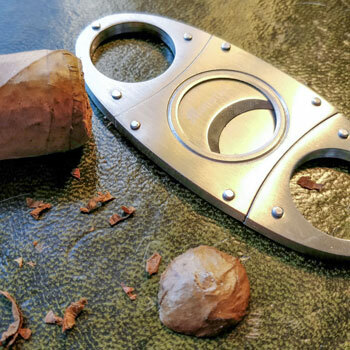 When you are ready to smoke your cigar, the time will come to cut the cap so you can draw through it. All handmade cigars are finished by adding a small piece of wrapper leaf over the head, which is called the cap. This secures the wrapper and its contents before smoking. However, most experts agree that you shouldn’t bite a cigar like a gangster in the movies. Rather than looking like Al Capone, you’ll end up tearing the wrapper and get bits of tobacco in your teeth! Whatever method you go for, the cut should be careful yet decisive. Furthermore, you don’t want to cut too high up the cigar’s shoulder as it may cause the wrapper to unravel as you smoke. If you look closely, you’ll notice one or several small seams along at the extreme end of the cigar’s head. You’ll want to cut below the one closest to the end in order to safely secure the wrapper. As mentioned above, cut in a decisive and quick movement as doing it too slowly can tear the wrapper. Known as the dry, raw, pre-light or even cold draw, many enthusiasts like to take a moment to puff on the cigar before lighting. This serves as a great indicator of what the cigar will be like when you smoke it. For instance, you’ll be able to detect the level of draw you’ll get from the cigar. Furthermore, letting the cigar meet your lips before it’s lit will give you a hint of what’s to come. Like smelling a wine’s bouquet, tasting the cigar cold will reveal notes and aromas that you may likely experience later. Although a raw draw doesn’t give you a precise indication, you can enjoy the tantalising prelude of the initial flavours. Much like cutting a cigar, there are many tools to choose from for lighting. Ensure that you’re properly equipped and avoid cardboard matches, candles or fluid-fuelled lighters, which each affect the taste. If you prefer to use wooden matches, wait for the sulphur to burn off before exposing the flame to the cigar. Furthermore, opt for long matches if you can as lighting a cigar can burn through a few. 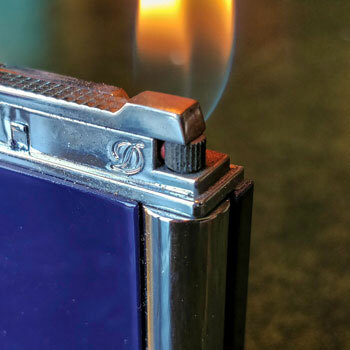 For this reason, butane lighters a more popular choice among many cigar smokers. Some even choose torch lighters, which provide an intense and even flame more convenient for lighting cigars. Toasting The Foot: Gently preparing the cigar’s extremities with the flame at a distance. Igniting The Filler: Bringing the flame closer and drawing it in with your mouth. Releasing The Draw: A final puff on the cigar against the lighter to create a flame. 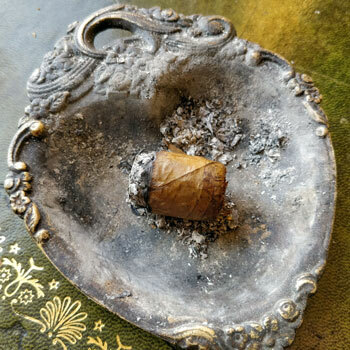 Blowing On The Cherry: Ensuring an even burn across the cigar’s foot by blowing on it. Remember to rotate the cigar while you do this. Exposing the cigar to the flame from only one angle may cause an uneven burn. For a full step-by-step guide on the above process, head to our detailed cigar lighting guide. Unlike cigarettes, cigars aren’t meant to be inhaled. Not only is inhaling cigar smoke uncomfortable and can provoke coughing but it’s very bad for your health. Instead, cigars are meant to be sipped like a refined beverage. Hookahs, cigarettes and even vaping is drawn by sucking the smoke with the lungs. However, you draw on the cigar by creating pressure with the centre section of your tongue. You can compare the action to sucking on a straw or blowing a kiss. Like tasting wine, savour the smoke by letting it float across your palate. Try doing this gently and don’t swirl it aggressively like mouthwash. When you’re finished, let the smoke blow back out of your mouth. Don’t puff too regularly on a cigar but take a few sips then let it rest. If you draw too often and too hard on a cigar, it will get hot and may burn unevenly. Allow the cigar to cool down to avoid compromising the flavours. Consider taking a sip between every 30 seconds to a minute to enjoy the cigar at its full potential. At this rate, it’s often suggested that a typical cigar should last between 45 minutes to an hour of smoking. Certain enthusiasts and some experts practice a technique known as retro-haling. This is a process which involves pushing the smoke down the back of the mouth and up the sinuses to be exhaled out of the nose. Being relatively difficult to achieve, it’s not recommended for beginners but worth trying when you’re ready. It will allow you to use the sensitive aromatic receptors in your nasal passage that bridge the divide between taste and smell. 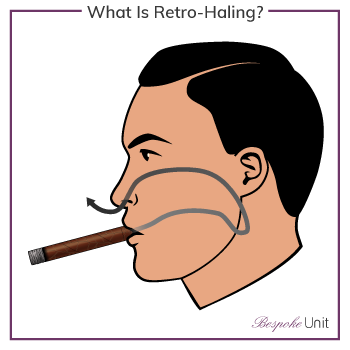 Retro-haling allows you to detect the full spectrum of flavours and you can discover subtle characteristics of your cigar. However, it’s not an easy task unless you’re accustomed to cigarettes. Be sure to exhale a bit of smoke out the mouth before retro-haling. Afterwards, you move the remaining smoke up through the nose instead of inhaling it as it approaches the back of the throat. As you exhale, you should able to release it through your nose. It’s very easy to accidentally inhale the smoke and passing it through the nasal cavity can be very overwhelming. It’s best to try this technique with a few puffs of a mild cigar. With their various shapes and sizes, it can be hard to find a comfortable grip on a cigar that isn’t awkward. You’ll want to hold it securely but be able to enjoy it at the same time. The preferred and conventional way of holding a cigar is between your thumb and index finger. 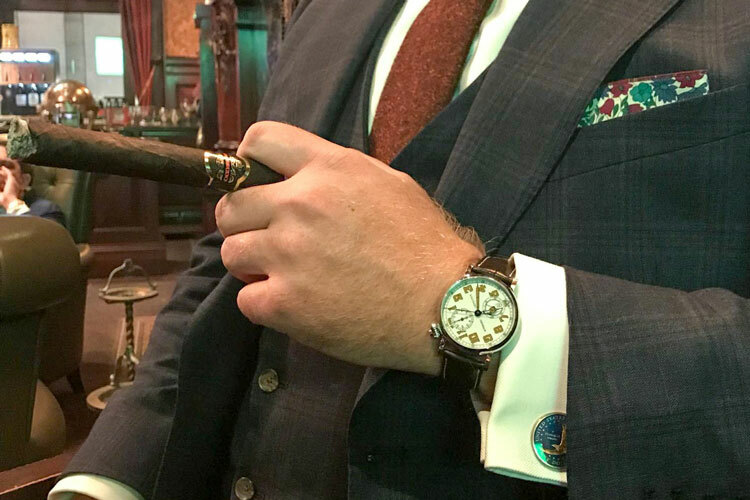 If the cigar is quite long, you can let your other fingertips rest across the body. As the cigar burns down, you can reduce the number of fingers that you use. Another particularly popular way of holding thick cigars is by curling your index finger of the band. The cigar’s head sits in the hollow of your thumb while the body is braced between the index and middle fingers. Thick of it as if you’re holding a gun and the cigar is a trigger. 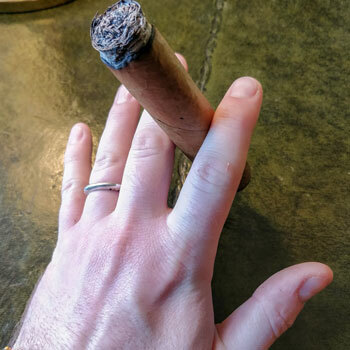 Some circles tend to frown upon holding a cigar between your index and middle fingers. Many see this as the way you’d hold a cigarette, which is undeserving of a cigar. However, it can also be somewhat unstable and it’s easy to lose your grip. Whichever way you choose to hold your cigar, try to refrain from animated gestures or pointing with it, which can the ash to drop off. Try to keep your hand relatively still with the cigar parallel to the ground. Finally, don’t grip the cigar between your teeth. Generally, chomping on a cigar can be considered poor form. Furthermore, it may damage the wrapper due to pressure and moisture, which will cause it to unravel. If you need to free your hands or want to give the cigar a rest, it’s perfectly polite to let it sit on an ashtray. Those designed specifically for cigars feature large indents or stirrups designed to let them rest without falling into the ash. Overall, it’s not recommended to tap off the cigar’s ash like a cigarette. Doing so will expose the embers or “cherry”, which can cause it to burn too hot. Likewise, letting the ash get too long may have the opposite effect and the cigar will be too cold. In either case, the length of the ash will have little effect on the smoke’s quality. Nevertheless, a high-quality and well-rolled cigar will be able to create a very long length of ash. Long ash on a cigar usually indicates that the cigar was rolled with the right tightness and consistency. Furthermore, it suggests that the length of filler leaf used was quite long too. Alternatively, cigars that lose their ash too easily may have been loosely rolled or made with short filler tobacco. Certain circles of enthusiasts like to compete by stacking the ash as long as possible. While this is indeed fun, it’s best avoided in more formal environments. Similarly, letting the ash get too long that it falls on the floor or in your lap is generally frowned upon. Although it may vary depending the cigar, the ideal length of ash is around an inch (2.5 cm), which a good cigar will unlikely lose. If you see the ash beginning to form a crack, it may be safer to remove the ash earlier. 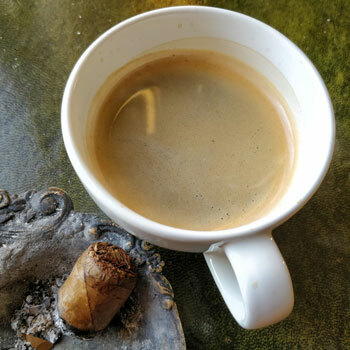 In order to maintain this length, gently rest the cigar against the side of the ashtray and either press it or carefully roll the end at an angle to remove some ash. Don’t press too hard as it may break off all the ash. If the ash resists too much, continue smoking and try again later. 8. Do You Remove The Band? Originally, the band was designed by Dutch-born cigar maker Gustave Bock in the 1830s as a way of identifying his products exported to Europe. However, there have been suggestions that they were created to secure the wrapper in place or even to protect the fingers from nicotine stains. Today, the bands are largely decorative and means to identify the brand. Like wine labels, the bands can be interpreted as a form of artwork and collecting them is known as vitolphilia. In either case, etiquette regarding the cigar’s band has been a subject of debate for many years. Some smokers claim that the band should be kept on out of respect for the manufacturer. Meanwhile, others believe that leaving on the band of a particularly expensive cigar is a form of boastful showing off. Generally, people tend to leave the band on when they start the cigar. Removing the band of a cold or freshly lit cigar can be difficult and risks tearing the wrapper. Letting the cigar warm up may loosen the band enough to make this easier. This ideal time for this can be anything between the first third and halfway. Additionally, you could consider this as a fair compromise between the two differing opinions. Whenever you choose to remove the band, make sure that you do it carefully using your fingernails to avoid damaging the cigar. Knowing how far down to smoke a cigar is mostly a question of personal preference. 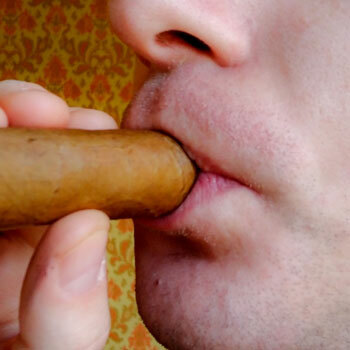 Cigar etiquette usually dictates that you should only smoke a cigar halfway. Meanwhile, other sources suggest that you should smoke up until the band or when three finger-widths are left. In reality, smoking a cigar only halfway means that you can miss out on some of the cigar’s most interesting nuances. Similarly, bands come in different shapes and sizes with some covering as much as half of the cigar itself! Instead, smoke until you feel satisfied with the cigar. If you decide to stop at any point, that is you choice. Conversely, if you want to keep enjoying your cigar, don’t let anyone stop you. As you smoke the cigar down, you’ll notice that its character changes and the aromas will evolve. Generally, a cigar becomes much stronger in the final third with distinctive peppery notes. Sometimes, they can get quite hot and crude near the end. If you don’t enjoy this, you can stop. However, if you’re really enjoying the cigar, you can always smoke it down to the nub but beware of burning your fingers! With experience, you’ll be able to instinctively decide when to stop. Nevertheless, if you’re in a formal setting consider letting the cigar go sonner rather than later. Once you have finished with your cigar, you’ll want to dispose of it. However, refrain from crushing it like a cigarette. Crushing a cigar won’t put it out straightaway but will create a big cloud of smoke. At the very least, this will stink out the room and fill it with smoke. At the very worst, it’s looked down upon by certain circles and may get disapproving looks. Instead, simply let the cigar rest on the side of an ashtray and it will eventually go out on its own. If you’re smoking at home, wait until it’s cold and be sure to dispose of the stub and its ashes. Leaving them too long in a room can leave a bad smell that takes time to dissipate. After having enjoyed your cigar, take a moment to savour the remaining flavours in your mouth. A good cigar will leave a pleasant aftertaste that can range from caramel to minty notes. However, you may want to smoke another or move onto something else. One of the best ways to achieve this is by eating or drinking something to cleanse your palate. As tobacco smoke is quite ammoniac, it’s a largely alkaline product. Therefore, you can aim to neutralise the flavours by opting for something acidic. Coffee is an excellent choice and a well-known palate cleanser. Alternatively, you can choose a spirit such as whisky or rum. If you prefer to avoid alcohol, soda is known to work well and lemon-based drinks contain decent levels of citric acid. Salted and roasted nuts are an ideal appetiser as well as cheese. 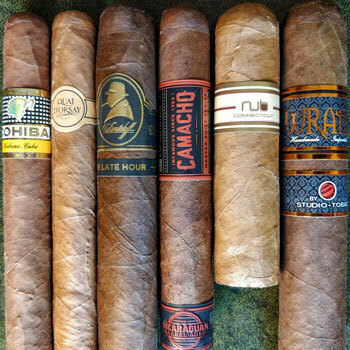 Finally, if your tasting a number of cigars, consider waiting at least 15 minutes before lighting up another.This will give your palate enough time to rest and reset itself. Similarly, ensure that the next one you smoke is stronger than the first or you may struggle to taste it. Now that you have learned how to enjoy a cigar, discover our more detailed guides on other practices. For instance, our cigar cutting and lighting guides feature extra hints and advice. 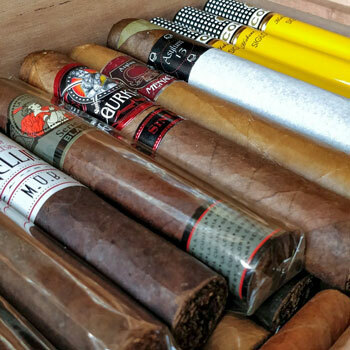 Alternatively, check out the best places to buy cigars!